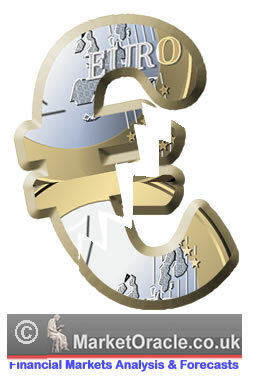 Whilst most in the mainstream press are occupied by the big numbers behind the Euro 720 billion / $1 trillion of bailout loans, and guarantees of the Eurozone PIGS, however the most important change announced was the European Central Banks intentions to buy the debt of Eurozone countries in effect adopting an open ended policy of Quantitative Easing or money printing to monetize the debt of bankrupting Eurozone countries much as the other central banks have been doing of the US, UK and Japan. Which means that the debt burden of the PIGS has been dumped onto mainly German tax payers therefore it's not surprising that European banks holding bankrupting PIGS debt have soared in price as the PIGS government debt they hold is now effectively being insured by the ECB. For the past 6 months Claude Trichet the head of the European Central Bank (ECB) has repeatedly stated that it is against the Eurozone rules for the ECB to buy Eurozone members debt. This iron clad rule at the core of the European Monetary Union has long since been factored into economic models that converged towards a deflationary outlook for imploding PIGS that could not compete against the highly competitive German economy that was boosted as a consequence of having weak economies as part of the Euro-zone which kept the Euro currency relatively weak thus allowing Germany an huge advantage in terms of exports which I covered in length in an article earlier this month (05 May 2010 - Greece Economic Depression Resulting in INFLATION NOT DEFLATION Surge ). Will the $1 Trillion Bailout Solve Greece / Europe's Debt Crisis ? NO, all the E.U. has done is to buy some time. Many bells and whistles were announced to accompany the $1 trillion extension of liabilities as the ECB will effectively transfer PIGS debt onto its own balance sheet. The package includes severe austerity measures for the PIGS involving deep spending cuts and tax rises. However these measures are of little value in the face of a potential default of one of the PIGS which would immediately trigger ECB debt financing of that country with little regard as to where the government stands in terms of the austerity plan. There IS NO SOLUTION TO GREECE'S DEBT CRISIS OTHER THAN A DEBT DEFAULT! In the meantime, the E.U. has sent the wrong signal to the bankrupting PIGS in that they can continue growing their respective debt mountains without little consequences in terms of paying the market rate of interest for the risk that their debt actually presents, that will continue to put pressure on the Euro currency as at some point down the road this $1 trillion bailout will be followed by another, then another each contributing towards sinking the Euro a few notches lower and inflation a few notches higher. Holders of Greece and other bankrupting PIGS debt have been given a chance to exit PIGS debt at far less loss than where the debt had been trading at prior to the announcement which was probably the primary purpose of the bailout as most of the Greek and PIGS debt is held by German and French banks. Greece in economic depression carrying a huge debt burden that continues to deleverage, that cannot devalue its currency OR print money because they they gave up those sovereign powers to the ECB. All of this suggests that Greece should be experiencing deep price deflation as many workers are being forced to suffer 30% pay cuts as a consequence of being forced to cut the governments budget deficit to back under 3% of GDP, Instead Inflation in Greece has soared from 0.5% in June 2009 to 3.9% for March 2010, as a consequence of ever escalating money printing and competitive currency devaluations that stoke the fire of the Inflation Mega-trend that continues to gather pace. The problem with the deflation argument for 2010 and beyond is that those the espouse it repeatedly refer to the 1930's just as they have been repeatedly referring to the stock price chart of the 1930's to imply a similar stocks bear market that is continuously busted each time the Dow makes a new high, only to be trundled out again in a few months time on the next correction. However this is NOT the 1930's. This is 2010!, the world is swimming in an instant global media soup where a small riot in Greece that someone living in a nearby street does not even notice, is magnified by the global media soup to imply the whole of Greece is burning and unlimited, imminent INFlATIONARY actions need to be taken before civilisation collapses. The politicians answer (in Democracies) is always to take the easy route rather than face the consequences from the global media soup's spotlight on difficult decisions that could result in an avalanche of adverse exposure, the easy route is always to seek to inflate ones way out of crisis by whatever means that results in money printing. Protect your wealth from the inflationary mega-trend that has boosted asset and commodity prices in most cases by more than 50% during the past 12 months whilst most still question the existence of the inflationary mega-trend and ramble on about NON Existant Deflation (CPI is at +3.4% NOT -3.4%). My FREE EBOOK contains 50 PAGES of of how to protect and grow your wealth as ever higher fiat currency supply seeks a home in scarce limited supply resources and asset classes as private sector and sovereign debt mountains EXPLODE into Much Higher inflation as we are witnessing with Greece today, especially as government's induced asset price inflation to prevent economic depression is increasingly spilling over into consumer price inflation the only response to which is rising market interests and rising risk of eventual sovereign debt default.